Authors: Kotelevets E.P., Maksimova O.A. Aim. To study the level of anti-diphtheria antitoxic antibodies in blood serum of vaccinated individuals over the period of 2015-2017. Materials and Methods. The study was conducted on the base of the Center of Hygiene and Epidemiology of the Ryazan region. The evaluation of antitoxic immunity against diphtheria was performed on the basis of the results of annual serological examination of at least 100 samples of blood sera for the content of diphtheria antitoxin in each age indicator group. In the study reaction of passive hem agglutination was used with standardized erythrocyte diphtheria antigen. Blood serum samples of individuals of indicator groups of the population with a documented history of vaccination were investigated. On the basis of the results of serological monitoring, the analysis of the state of anti-diphtheria antitoxic immunity in children (3-4 years, n=300), teenagers (16-17 years, n=302) and adults (30-39 years, n=323; 40-49 years, n=305) of the Ryazan region in 2015-2017 was carried out. Results. The level of protection among children, teenagers and adults in the studied period was 97.0 and 95.6%. The intensity of anti-diphtheria immunity was also high: 93.3-95.6% of the examined persons had medium and high antibody titers. Protective level of anti-diphtheria antibodies in 2015 was revealed in 97.3%, in 2016 – in 93.3% and in 2017 – in 98.3% of the examined samples. Conclusion. Analysis of the results of serological monitoring showed a positive dynamics of growth of the number of seropositive individuals with intense anti-diphtheria immunity. The data of serological monitoring correspond to the official statistical data of Directorate of Rospotrebnadzor in the Ryazan region on the high level of coverage of the population with vaccination. According to previously published epidemiological studies, in such conditions the incidence of diphtheria in the population is sporadic. diphtheria, immunity, specific immunity, community immunity, serological monitoring, antibody titers. The last epidemic rise of diphtheria morbidity in the Ryazan region was recorded in 1993-1998. Effective prophylactic vaccination with a high coverage of the population (98.0%) permitted to stabilize the situation with reduction of the number of cases to 1-2 per year. Since 2009 no cases of diphtheria have been reported in the Ryazan region . On the whole, the morbidity in Russia also has a sporadic character, and the number of studies of this infection decreased 4.1 times within the recent 10 years [2,3]. The data of laboratory bacteriological studies conducted with the prophylactic purpose show the absence of toxigenic cultures of Corynebacterium diph-theriаe in the studied material. Non-toxigenic cultures of Corynebacterium diphtheriае biovar mitis were isolated in 0.2% and 0.5% of samples in 2016 and 2017, respectively [1,2]. However, the epidemic tendency to reduction of the level of morbidity is not the reason to weaken control over the situation, since the reservoir of the agent is preserved in organism of carriers, and the development of epidemic process in the vaccinated population cannot be excluded. This determines the necessity for dynamic monitoring of the intensity of antitoxic anti-diphtheria community immunity which permits timely identification of signs of the impairment of epidemiological situation with the existing tendency to growth of a share of seronegative individuals . In view of the above, the aim of the work was a study of the level of anti-diphtheria antitoxic antibodies in blood serum of vaccinated individuals of different age groups in 2015-2017. The study was conducted on the base of Centre of Hygiene and Epidemiology of the Ryazan region. Assessment of the population immunity against diphtheria was based on the annual examination of at least 100 samples of blood sera in each indicator group for the content of diphtheria toxin in passive hemagglutination reaction with use of standardized erythrocytic diphtheria diagnosticum. Indicator groups included individuals with documented vaccination history. Information of coverage of the studied groups with vaccinations was obtained from the official data of Directorate for Consumer Rights and Health Protection Agency (Rospotrebnadzor) for the Ryazan region . The work was conducted in accordance with Methodical Instructions МU 3.1.2943-11 on «Organization and Conduction of Serological Monitoring of Community Immunity against Infections Managed by Means of Specific Prophylaxis (diphtheria, tetanus, pertussis, measles, German measles, mumps, poliomyelitis, hepatitis B)» which defines individuals as protected from these infections if their blood serum contains antitoxic antibodies in the titer 1/20 and higher . Blood sera of 1230 individuals were examined. In 2015 sera of 100 children of 3-4 years of age were examined (the age of formation of basic immunity), and in 102 teenagers of 16-17 years («indicator» group of «the quality» of vaccinations conducted at schools and institutions of professional education). Besides, sera of adult individuals of the age group of 30-39 years (n=101) and of 40-49 years (n=105, groups of risk for diphtheria morbidity) were examined. In total, in 2015 408 individuals were examined. In 2016 sera of 100 individuals of each mentioned above age groups (in total of 400 individuals) were examined. In 2017 sera were examined in age groups of 3-4 years and 16-17 years in 100 individuals of each group. In age groups of 30-39 years and 40-49 years sera were examined in 122 and 100 individuals, respectively. In total, in 2017 422 individuals were examined. The relative values obtained in the study were statistically processed by methods of variation statistics using Microsoft Office Excel program. The parameters were calculated with determination of the arithmetic mean, standard error and mean standard deviation. The reliability of differences was evaluated using Student’s t-test. The difference of results was considered statistically significant at р<0.05. The data of studies conducted in 2015, showed a high level of anti-diphtheria immunity among children and teenagers – 95.0 and 98.0% including those with 1/320 and higher titers– 52.0 and 67.0%, respectively (protective titer is 1/20 and higher). In the age group of 30-39 years antitoxic antibodies in the protective titer were detected in 99.0% of examined individuals, and in the group of 40-49 years – in 98.1%, with 1/320 and higher titers in 63.0 и 55.2% of the individuals, respectively. In general, in 93.7% of the examined samples protective titer was found, including 1/320 and higher titers in 58.8% of samples. However, in 11 individuals (2.7%) the titers 1/10 and lower were found, including 5 children in the group of 3-4 years, 2 teenagers in group of 16-17 years, and in adult groups of 30-39 years and 40-49 years, respectively. In 2016, in 93.3% of examined samples protective antibody titers were found with 1/320 and higher titers in 65.5% of samples which is 6.7% higher as compared to similar results of 2015. In children of 3-4 years the protective level of antitoxic anti-diphtheria immunity was found in 96.0%, in teenagers of 16-17 years – in 99.0% with 1/320 and higher titers in 57.0 and 87.0% of them, respectively. In the age group 30-39 years the protective titers were found in 95.0% of the examined individuals, 69.0% of them had 1/320 and higher titer. In the group of 40-49 years the protective level of antitoxic anti-diphtheria immunity was found in 83.0% of individuals, 49.0% of them had 1/320 and higher titers. However, in 27 individuals (6.7%, which is 4.0% higher than in the previous year) 1/10 and lower titers were found: in 17 individuals of 40-49 years age group, 5 individuals of 30-39 years age group, 4 individuals of 3-4 years group and 1 individual of 16-17 years group. Studies conducted in 2017, showed the presence of protective titers in 98.3% of the examined individuals (4.6% higher than in 2015), including 1/320 and higher titers in 80.6%, which is 5.0% higher than in the previous year. 97.0% Of the examined individuals in the group of children and teenagers had protective titers, of them 80.6% of children of 3-4 years group and 84.0% of teenagers had titers 1/320 and higher. In the age group of 30-39 years the protective antibodies were found in 100.0% of the examined samples, including 1/320 and higher titers in 79.3% of samples. In the age group of 40-49 years, 99.0% individuals had the protective level of antitoxic anti-diphtheria immunity. In the same year 14 examined individuals (3.3%, which is 3.4% lower than the similar parameter for 2016) had no protective titers: 8 individuals in the age group of 40-49 years and 3 individuals in the age group of 3-4 and of 16-17 years each. Thus, there may be noted a modest tendency to increase in the level of the community immunity among children of 3-4 years (by 1.0% in 2016 and 2017), including children with the titers 1/320 and higher – by 5.0% in 2016, by 23.0% – in 2017 in comparison with 2016. The unstable positive dynamics was seen in the group of teenagers (16-17 years), of adults of 30-39 years and of 40-49 years. In 2016 in teenager group 20.0% increase in the amount of sera with antibody titers 1/320 and higher was noted, in 2017 –3.0% reduction relative to the previous year. In the age group of 40-49 years these sera decreased by 6.2% in 2016 and increased by 50.0% in 2017. However, the amount of examined sera with 1/320 and higher antibody titers in some age groups showed a stable tendency to growth. In the age group of 30-39 years 6.0% increase was noted in 2016 and 10.3% increase in 2017. The obtained results were confirmed by a favorable epidemiological situation: in 2015-2017 no cases of diphtheria were reported in the Ryazan region . The diphtheria morbidity is kept at the low level through realization of the complex of prophylactic and antiepidemic measures, and through serological control over the effectiveness of the conducted immunization [1,5-7]. The results of conducted serological examinations showed the general positive dynamics (4.6% increase) of the protective level of antibodies in the indicator groups. The general increase in the intensity of antitoxic anti-diphtheria immunity was noted – by 6.7% in 2016 and by 5.0% in 2017. To keep diphtheria morbidity at low level it is reasonable to continue the whole complex of antiepidemic measures with a strict serological control of this infection in accordance with the normative documents in effect. O sostoyanii sanitarno-epidemiologicheskogo blagopoluchiya naseleniya v Rossiyskoy Federatsii v 2017 g. Gosudarstvennyy doklad. Moscow: Fede-ral’naya sluzhba po nadzoru v sfere zashchity prav potrebiteley i blagopoluchiya cheloveka; 2016. (In Russ). zabolevaniy: Materialy KH s’yezda Vserossiyskogo nauchno-prakticheskogo obshchestva epidemiologov, mikrobiologov i parazitologov. Infektsiya i Immunitet. 2012;2(1-2):40-1. (In Russ). Yakimova TN, Markina SS, Maximova NM. Diphtheria nowadays. Population Health and Life Environment. 2013;12(249):18-9. (In Russ). Laboratornaya diagnostika difteriynoy infektsii. Metodicheskiye ukazaniya. Moscow: Federal’nyy tsentr gigiyeny i epidemiologii Rospotrebnadzora; 2013. (In Russ). Organizatsiya i provedeniye serologicheskogo monitoringa sostoyaniya kollektivnogo immuniteta k infektsiyam, upravlyayemym sredstvami spetsificheskoy profilaktiki (difteriya, stolbnyak, koklyush, kor’, krasnukha, epidemicheskiy parotit, poliomiyelit, gepatit V). Metodicheskiye ukazaniya. M.: Federal’nyy tsentr gigiyeny i epidemiologii Rospotrebnadzora; 2011. (In Russ). Abramova AO. Infectious morbidity in the system of social-hygienic monitoring. I.P. 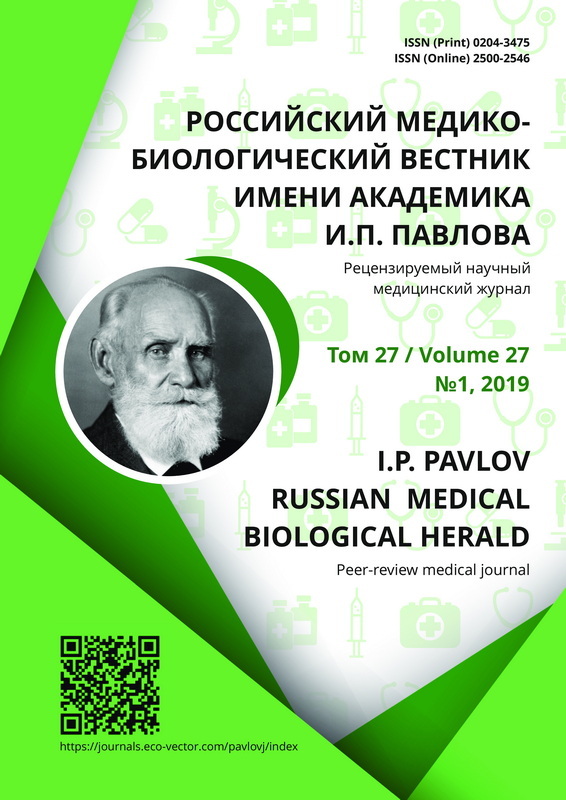 Pavlov Russian Medical Biological Herald. 2012;20(3):166-72. (In Russ). Kazaeva OV, Forostov SD. Features of immunity to measles infection in the penitentiary system by the results of serological monitoring. Nauka molodykh (Eruditio Juvenium). 2013;(3):68-70. (In Russ). Copyright (c) 2019 Kotelevets E.P., Maksimova O.A.